Shortly after my surgery I was fortunate to find a second online support group. This one was for acoustic neuroma patients, but thanks to one of life’s little ironies there is actually a higher risk for facial paralysis during surgery on the eighth cranial (acoustic) nerve than on the seventh (facial). This forum had a section dedicated to post-surgical facial effects, and they were kind enough to let me join their group. One of my newfound internet friends, “LADavid,” was an aspiring actor and author. You may have seen him in Reba, NCIS, Alias or Brothers & Sisters. If you saw Transformers, you surely noticed his red-stockinged feet as he asked a stewardess to round him up some Ding Dongs. He was a stand-in for the 2007 movies Slipstream and The Bucket List. That October he appeared in a TV Guide print ad for Cave Man. Then, in early December, David Shannon was blindsided by a triple whammy following acoustic neuroma surgery: hearing loss, facial palsy and impaired balance. David’s combination of complications cut his acting career short, but he refocused his creative energy into writing. This summer, David’s memoir was published. 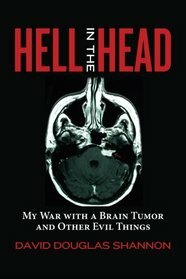 Sometimes heartbreaking, sometimes humorous and always honest, Hell in the Head: My War with a Brain Tumor and Other Evil Things is a frank look at how, with the help of God, family and friends, the human spirit adapts to the unexpected. David’s next venture is a mystery suspense novel. He is also interested in developing screenplays. 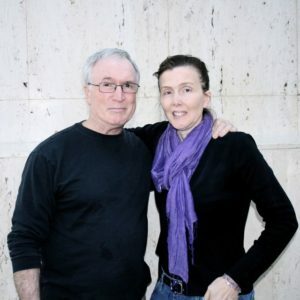 I had the good fortune to meet David last New Year’s Eve during a layover at LAX on the way home from visiting Hanna in Vietnam. The flight had been turbulent (a story for another time) and Phil and I were both feeling the effects. Unfortunately I was not up to the long conversation about our writing careers that I had eagerly anticipated, but David was a godsend: kind, considerate and helpful in getting us to our next flight. I’m not sure how to calculate David’s odds. The incidence of acoustic neuroma is roughly twice that of HFS, but he scored the triple threat of complications. Let’s just say he is definitely a member of the One in a Million Club. I experienced a life-altering event in 2008. It’s too complicated to include in a getting-to-know-you piece, and would likely keep me from going on Jeopardy! even should I someday pass their wretched test. In 2002 I was diagnosed with a rare neurological condition called Hemifacial Spasm. HFS is caused by irritation to the seventh cranial nerve. This may be due to a tumor, multiple sclerosis, or as in my case, a blood vessel coming into contact with it and wearing away the myelin sheath. The irritation causes nerve impulses to backfire and the affected side of the face twitches, intermittently and uncontrollably. This is disfiguring, disconcerting and exhausting. The estimated incidence of hemifacial spasm is one in 100,000. There are three treatment options: medication, Botox, and surgery. The medications for HFS are also used for epilepsy, the theory being to calm nerve impulses. Unfortunately, drug therapy is notoriously ineffective in controlling hemifacial spasm. I tried three or four different medications. None gave more than slight relief and all had bothersome side effects. To be honest, one of them did cause me to lose a significant amount of weight, which was actually welcome, but it also caused my fingers and toes to go numb and my lips to turn purple. The one that was best in taking the edge off the spasms quite literally made me stupid. Mid-sentence I would be unable to come up with the next word. My neurologist tried to convince me that it due to the natural aging process, but I knew otherwise. For a writer, this was a very sorry state of affairs. Most people know of Botox as a wrinkle reducer, but it also has therapeutic applications – for example, helping children with cerebral palsy deal with muscle spasticity. Technically a poison, Botulism toxin works by paralyzing a muscle so that it can’t react to the nerve impulses it receives. In the case of HFS patients, injections into affected muscles around the eye, cheek and mouth gives three months or so of relief from spasms, when properly administered. A little too much, though, and the patient will look like he or she had a stroke until the effects of the toxin wear off. Despite the drawbacks, many HFS patients are satisfied with Botox treatments, although over time the body develops a tolerance and the time between treatments will become shorter. I was petrified of a bad experience, but once my spasms reached the point of being the first thing I felt in the morning and the last thing I experienced as I fell asleep at night, I decided to give Botox a shot (pun intended). On injection day, I expressed my fears to the neurologist. His response? I read too much and once I had the treatment I would be entirely satisfied and live happily ever after. Just before moving into the procedure room, he asked me to sign a waiver that I would not hold him responsible should any of those unfortunate incidents, or a few others I had not even thought of, occur. He refused to recognize the irony in this, even when pointed out. Did you know that Botox shots really hurt? (Seriously – I now possess a grudging admiration for celebrities who subject themselves to periodic punishment in the name of youth and beauty.) I got four or five injections around my eye, mainly in the upper lid, one in my cheek and one by my mouth. Then the doctor told me that I would see the effect in about two weeks and it should last for three months. The next afternoon I was reading a book when I noticed that my left eye was itchy. I went to the bathroom to check it, and discovered that I COULD NOT BLINK THAT EYE. So much for two weeks. Over the next few months the muscles that were injected did stay calm. However, the surrounding muscles twitched in their stead. One muscle in my forehead was so active that it gave me what to this day I fondly call my “Botox wrinkle.” On the advice of my ophthalmologist, who did not like what dry eye could do to my vision, I cancelled my three month follow-up. After six years of intensifying spasms, brain surgery started looking better and better. I saw patient after patient on the web support group I belonged to report excellent results. Because HFS is a rare disorder, there are very few surgeons who specialize in the microvascular decompression (MVD) surgery to repair it. I selected a neurosurgeon, “Dr. C,” who had trained under the doctor who pioneered the surgery and had significant experience but wasn’t yet approaching retirement age. Miraculously, my insurance company approved my out-of-network request right away. My surgery took place June 2, 2008. I awoke to a raging headache and extreme nausea and knew even before touching it that the left side of my face was paralyzed. I was also deaf in that ear. Dr. C reported that everything went reasonably well during surgery and he padded two arteries and half a vein before he felt he had to quit. He described my nerves as “unhappy” during the surgery but noted that the facial nerve was responding to stimulation during the entire procedure. Usually that is good news, but he somberly stated that he had a “bad feeling” about my facial nerve. He said that after three months I could consider a nerve graft, and recommended a surgeon at the University of Missouri if I wanted to stay closer to home. At my pre-op consultation, Dr. C had told us that about one in ten patients comes out of the surgery with some degree of facial weakness or paralysis. At my post-op exam, he added that about one in ten of that group sees no recovery from the paralysis. After four years, I estimate that about 65-70% of my facial function has returned. That’s the equivalent of “D-” on an exam, but on the bright side, I have regained “symmetry at rest,” meaning that impairment is not noticeable in a neutral expression. I can manage a small smile, but my former toothy grin is gone forever. My mouth looks funky when I talk, but I have discovered that one-on-one, people tend to focus on my eyes rather than my mouth. In fact, most people do not notice anything wrong. My blink function is not normal, but I can close my eye and even wink if I concentrate. I need to keep lubricating gel on my eye at all times, but I have adapted to the half-fuzzy vision. I am very thankful that I had LASIK surgery pre-MVD, because I would not be a suitable candidate now. I have recovered about 85% of my hearing and these days only notice the deficit in crowds and large spaces. That is how I literally became one in a million. One in 100,000 for hemifacial spasm and one in ten for facial paralysis following surgery. I am thankful not to be the one in ten million who never recovers any facial function. Romans 8:28 tells us that “in all things God works for the good of those who love Him.” At first I had a difficult time believing that anything good could come from facial paralysis, but I have been blessed to meet some wonderful people who share the same fate. Some, like me, had hemifacial spasm, while others were diagnosed with another rare neurological disorder called acoustic neuroma. Next week I will introduce you to one of them. This is a sample piece that I wrote a few years back to introduce myself when I pitched a research column idea to the local newspaper. For some inexplicable reason known only to the editors, the paper did not pick up my idea. Most of the material in the piece still applies (although I am no longer a substitute teacher and I have another book published), so I’m recycling it here. I am a big Jeopardy! fan. Besides trying to be the first to blurt out a particularly obscure question, I have also become a connoisseur of the contestant interview portion. Typically, an interview falls into one of three categories: A) that was pretty interesting, B) that was really pathetic, or C) I can’t believe s/he would say that on national TV! I think the best interviews reveal something about the contestant’s personality in addition to offering an amusing anecdote. AT: Sara Hartman is a homemaker, substitute teacher and freelance author from Jefferson City, Missouri. Sara, it says here that you are a published author. What have you written? SH: Alex, I write a column for the Jefferson City News-Tribune, along with magazine and web articles. My rhyming Bible storybook for children, Mary Magdalene’s Easter Story, was published earlier this year. Another one, Moses and the Ten Plagues, will be published next summer. AT: Do you enjoy writing in rhyme? That can sometimes be challenging. SH: Yes, I do. Though rhyming is less challenging than fitting a story like the ten plagues into a 64-line format. AT: I can see where it would be. Good luck with your writing. AT: Our returning champion, Sara Hartman, was struck by lightning as a child. Sara, tell us more about that. SH: Well, Alex, I was playing outside with my older brother and younger sister while my mother was inside with our baby brother. A lightning ball rolled down a telephone pole and knocked the three of us senseless when it hit the ground near where we were playing. A neighbor saw it happen and ran for my mother, but we were getting up by the time she reached us. AT: That must have been a relief. No lasting effects then, I presume? SH: My family and friends might tell you otherwise. AT: (laughing) I see. Well, we’re glad to have you here answering questions with lightning speed. Now pick up your signaling device. You have the lead and control of the board. AT: Sara Hartman is our returning two-time champion. It says here that your great-great-grandfather had three wives . . . all at the same time? SH: That’s right, Alex. Census records show that he lived with a wife and three children in 1850. By 1860, he had left his family with her parents. After fighting for the Confederacy in the Civil War, he married my great-great-grandmother. In 1885 he married a third wife. According to family lore, she was the pregnant girlfriend of my great-grandfather. At the time of their marriage, both his first and second wives were still alive, and no divorce records have been discovered. There are rumors of one or two more wives, but so far no documentation. AT: That’s quite a story. SH: Yes; did I mention that he was also a circuit-riding Baptist preacher? AT: (laughing). I’d love to hear more, but it’s time to pick up your signaling device and make a selection. AT: Three-time champion Sara Hartman’s unborn baby was serenaded by Al Green. Sara, how did that come about? SH: Alex, at the time I was the media specialist for the Census Bureau during a special census of St. Louis City. I had organized a media kickoff event that featured Al Green, who had recorded a public service announcement for the census. When we were introduced, Reverend Green sang a lullaby to my belly. He also predicted that I would have a son. SH: No, ten days later I had a baby girl. AT: Sara Hartman appears today in hopes of becoming a five-time champion. I understand that your wedding ring has an inscription from a movie. What does it say? SH: Alex, shortly before we became engaged, I learned that my husband had never seen The Princess Bride, one of my favorite movies. Naturally, I invited him to watch it with me, and he was hooked too. When we ordered our wedding rings, he had “As you wish” engraved in mine, and I had “I will never doubt again” inscribed in his. AT: The Princess Bride is one of our family favorites as well. Lots of good quotes. SH: Yes, our daughter continued the tradition when she ordered her class ring. AT: Oh? What quote did she select? AT: (laughing) On that note, let’s pick up those buzzers and return to the game. Until next time, I highly recommend The Princess Bride to anyone who hasn’t seen it. Sooner or later, Jeopardy! is bound to have a category dedicated to it.